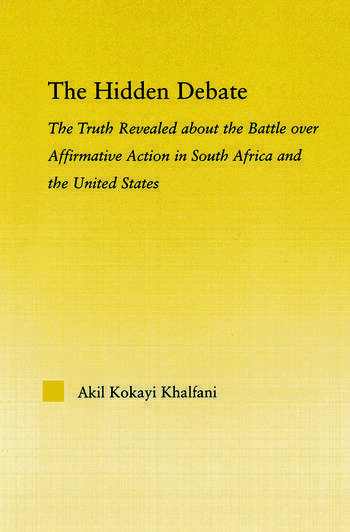 The Hidden Debate is a fresh and cutting-edge comparative analysis of the ongoing and highly charged social conflict over affirmative action in South Africa and the United States. The debate over affirmative action has raged for over 30 years in the United States and since the early 1990s in South Africa with minimal agreement or resolution. In part this discord remains because scholars, journalists, politicians, and other social analysts have failed to properly specify and examine the problem. Dr. Khalfani is President and Founder of ATIRA Corp, a Think Tank that develops solutions to African problems globally. He is an Assistant Professor of Sociology at Essex County College and is also a Research Associate with the African Census Analysis Project at the University of Pennsylvania. He is currently editing a special volume of Critical Sociology that examines racial statistics.